Frameworks on Flickr - Photo Sharing! 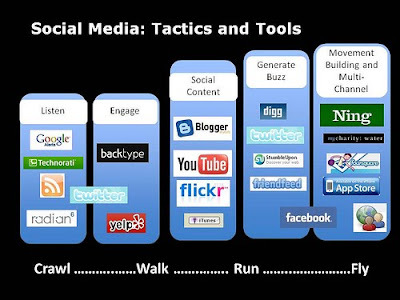 Social Media Tools provide enormous opportunities for genealogists to share and communciate. Do you crawl, run, walk or fly? Come fly with me - it's worth the ride. "A series of family history classes for beginners are planned at Hawkesbury Library. First class is on "Using certificates & church records" on Thursday 29 April 6pm. Email history@hawkesbury.nsw.gov.au for more information." Try making them with the kids this Anzac long weekend. Mix these together and drop into the saucepan of butter and golden syrup, this will fizz lightly and pour the warm mixture into the bowl of oats sugar and flour. Mix well and drop teaspoons of mixture onto a greased or lined baking tray, bake in moderate oven 160C for ten minutes or until golden brown, remove the biscuits from the baking tray, allow to cool, devour! Ever so slowly I am adding more flesh to the bones of my family site http://www.geniaus.net . I try to upload a new gedcom from The Master Genealogist containing alterations and additons to the site each month. This image shows the state of my site as of this evening. When it was first launched I downloaded and tried Picasa as a means of organising my photos it did not provide the features I wanted so I looked for another tool. When time permits (and it doesn't too often) I use Adobe Photoshop to edit new photos and restore old ones to their former glory but I like to have a simple tool that allows me to apply Metadata, do simple fixes and search and retrieve photos easily. Initially I used the free Adobe® Photoshop® Album Starter Edition but it just couldn't cope with the number of photos I had (around 30,000 at that time). I moved over to Adobe Photoshop Elements 4.0 and have been using Elements 6.0 since its debut. This program struggles with my collection of 65,000 digital images on an external hard drive. As I have read some unflattering reviews of Elements 8 I have not bothered to upgrade to version 8. As version 6 still works (albeit slowly) I have not actively looked for another product to replace it. I was recently on a Caribbean cruise that featured photographer, Peter Simon, as a guest lecturer and workshop presenter. Peter, a gentle man who has been taking photographs for 50 years, was a willing and enthusiastic tutor. In the few hours we spent with Peter my husband and I took on board many tips that we applied to our holiday snaps and that should enhance our future photographic efforts. We and other cruisers noted that Peter was using Picasa to download and organise his photos. In the workshops as he showed us examples of his stunning work and imparted his knowledge we were able to see various features of Picasa demonstrated. Peter suggested using Picasa as a 'staging post' to initially organise and edit photos. He then suggested using Photoshop to do more complex edits. After Downloading a few thousand holiday snaps I decided to trial Picasa. The free download was easily installed and my photos imported. I quickly found that this program is a delight to use. So pleased was I that I imported the folders containing my 65,000 photos into Picasa. This happened very quickly and y photos were imported with their tags attached. I find this tagging facility very easy to use although I would like to be able to nest my tags into categories. I love the ability to drag and drop photos into albums and the ease with which one can move files from folder to folder. Being able to upload pictures directly to Blogger is a bonus I hadn't expected to find. See my first uploaded photo in the previous post. The quick edits functions are situated conveniently on the desktop and so easy to use. That Picasa is a free application just adds icing to the cake. I am going to say goodbye to Photoshop Elements and use Picasa. Genealogists, if you are looking for a simple, user friendly program to organize your photos Picasa is worth a try. Thank you Peter Simon for your suggestion. As ANZAC Day approaches I think of my Dad, who served in the 2nd/7th Field Regiment, and the many other young Australian men and women who served our country in various overseas conflicts. Preview of Changes to Ancestry.com Search: "
We’ve been working on some changes to search, and want to give you a preview before it’s finalized, so we’ve created a small guided tour that will be launching on the site in a few days. First of all, I’d like to say thanks to all of you who have put time into helping us, posting to your feedback on the blogs, on our message boards, during usability studies, at conferences, in focus groups, those who we have visited in your own homes, and especially those who have contributed to the user group which reviewed the early prototypes. What we heard was that Ancestry Search needs to give you more control of your searches, more relevant results, better ways to find our data collections, and ways to search more efficiently. Based on your input, over the coming weeks and months, we’re planning on making a number of changes to the way search works. Search homepage – We’ll be developing a new search form, a clickable map, links to all our content categories, and new features to help you find information you’ve seen in the past. Explore by Location – We’ll be offering a new browse experience for data collections by country, state, or county. Recent Activity – We’ll be introducing new ways to keep track of recent searches and the collections you have browsed to recently. You can restart your research more quickly after taking a break with these new tools. Search Forms – We’ll be making some changes to both the basic and advanced search forms – some elements will be launched in advanced search this week, others are still work in progress. We’ve tried to find new ways to help you enter the information you know more easily and give you more control over the results you get back. For those of you who are using “old search”, we are not proposing any changes. However, we hope you’ll give the new tools a go as we launch them onto the “new search” site, and be open to trying new ways to see if you can find elusive ancestors that maybe the new tools can help you uncover… we’ve paid special attention to feedback from users of “old search” and hope you’ll find this reflected in the upcoming changes. We’ll be posting a link to the preview on this blog as soon as it’s available, and also across the search pages in a blue bar at the top of the page. It’ll also be included in the next Ancestry newsletter. We’re still in the process of finalizing the design, and we want to hear what you think. We’ll post a link to the preview soon. When we do, please take the tour, and give us your feedback by filling out a survey at the end. The Rookwood Necropolis in the western suburbs of Sydney is Australia's largest cemetery. As well as being the final resting place for my maternal grandparents, maternal great-grandmother and a clutch of other relatives it is the last home of many famous Australians. For those searching for deceased ancestors there is an Anglican and General deceased search facility on the cemetery's website. The Friends of Rookwood provide regular tours of this 17 hectare site near Lidcombe. In addition to day tours there are twilight tours conducted by volunteer guides from this association. Details can be found on the Society's website. "FACEBOOK use is a primary indicator of a new "digital divide" between people for whom using the internet is a way of life, and those who go online to perform specific tasks, according to research firm Nielsen Online." Genealogists - on which side of the divide are you? Open House at St Matthew's, Windsor. I am disappointed that I cannot attend this event as I have convict family connections with this church. Where: 1 Moses Street Windsor. Bookings Essential, contact 02 4577 6677 for more info." Where is Edward R Peterson? Left behind in a house we purchased in the Hornsby Shire was a box of musty old books. 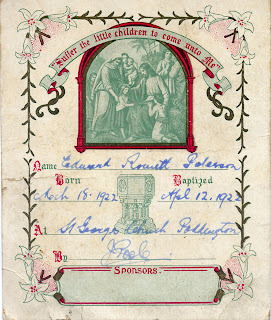 Flipping through the pages of one I found a Baptismal Certificate for Edward Rouett (?) 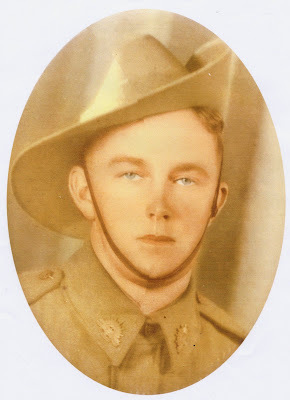 Peterson who was born on March 18, 1922 and baptised at St George's Church, Paddington on April 12, 1922 by J. Poole. Who is Edward? I have searched Ancestry, The Ryerson Index, NSW BDMs, SAG Primary Records, Google and Trove but can find no clues to his existence. I would love to reunite Edward's family with this certificate. If I fail I will give the certificate to The Society of Australian Genealogists who will hopefully add it to their Primary Records Collection. Today is April 1, April Fools Day. I took a look in my family history database to see what happened on that day in Geniaus' Family History. There were 8 people born but I won't list two as they are still living. There were two christenings, both in Dorchester.